What is P-Net? Who or what is Lucy Monostone? 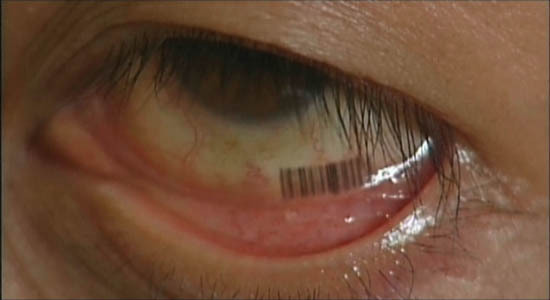 How can a virus cause people to get bar codes on their eyeballs? How come some bar codes are black and some are red? What exactly went on with the detective’s wife and why? When was the detective changing personalities and why did it matter? Why do iMac computers appear prominently in every episode? And what exactly is the deal with the eyepatched snuff-film collector and what cult is he in and what does it have to do with anything else? These are just some of the things I never figured out about this movie. Our MPD detective (above center) is both Amamiya Kazuhiko and Kobayashi Yosuke, and sometimes (?) also Nishizono Shinji. 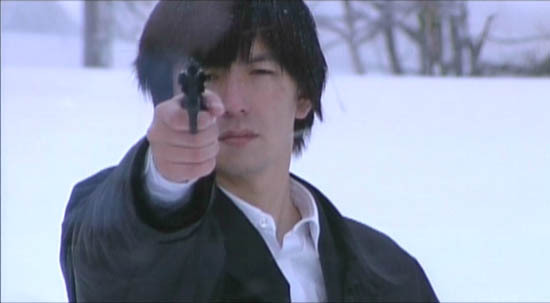 Played by Naoki Hosaka from Salaryman Kintaro. 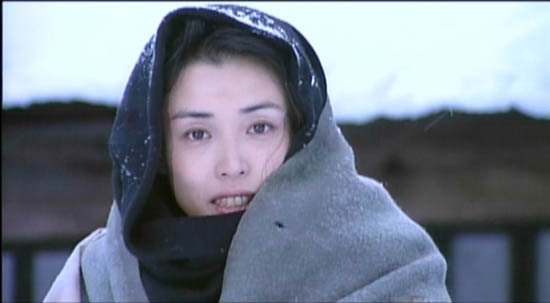 Not exactly a Miike regular, and in the interviews he said Miike barely spoke to him. 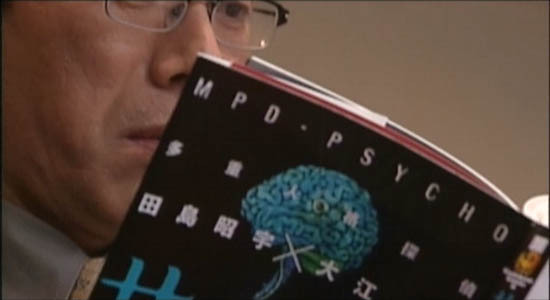 The police chief in this town is Sasayama (below, reading the source comic), played by Ren Osugi of at least ten other Miike films, six Kiyoshi Kurosawas, six Takeshi Kitanos, Twilight Samurai, and Uzumaki (he’s the dad who eats the spiral-rolls). Wow. 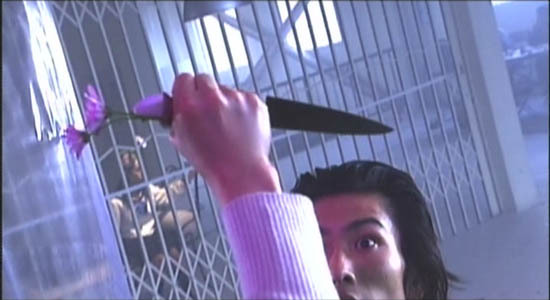 Accordingly, he was my favorite actor in MPD Psycho. Then we’ve got evil psychologist Isono Machi (Tomoko Nakajima of Parasite Eve), hilarious model-crafting young cop Manabe (Sadaharu Shiota), the detective’s wife Chizuko (Rieko Miura), eyepatch-bearing video collector Toguchi (Yoshinari Anan) and Sasayama’s wife or mistress or both, Mami[ko] (Fujiko, the slutty daughter in Visitor Q). 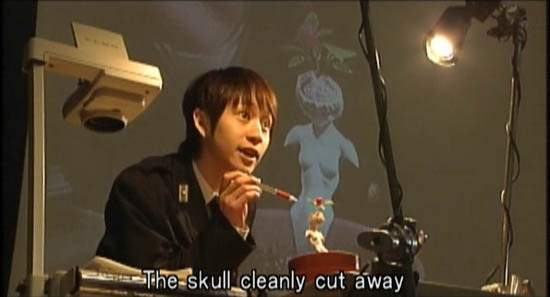 Each episode has its own bizarre series of deaths – from a religious cult schoolgirl machine-gun killing to pregnant women’s babies being surgically replaced by telephones, to the ol’ skull-saw flower-in-the-brain (above) to spontaneous combustion. Each is somehow caused by ghostly killer Nishizono Shinji, who can pass from one person to the next through touch, telephone or internet. Everyone’s girlfriends and wives get killed, Machi turns bad, the whole police force turn their back on the cases and pretend Sasayama and Manabe don’t exist, we learn the terrible truth about Shinji and trans-gender rock star Lu-C Monostone (the terrible truth is probably not terribly important, but it’s summarized 17 minutes into the last episode if you want a refresher course later), the Gakuso Group and P-Net are mentioned from time to time, and all along, Kobayashi is turning into Amamiya and vice-versa but lead actor Naoki Hosaka’s face remains so blank that I can never tell when. 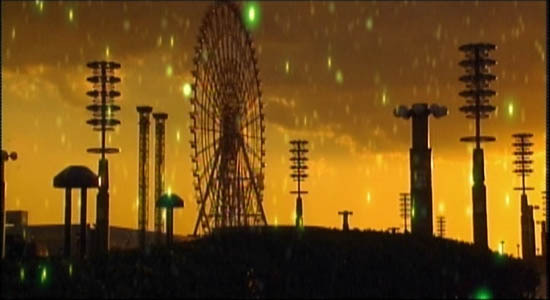 Besides the iMacs, we get recurring scenes on a giant ferris wheel, black-and-white snippets of animation, regular appearances by the eyepatch guy, cool totally fake rain (sometimes glowing green, as seen below), and Lucy Monostone’s hit song “same blue sky in a strange new world”. I didn’t love the movie… didn’t even like it as much as I thought I would… but definitely not bad, worth watching. Makes for good rainy-day viewing. Would maybe like to see again and figure out the MPD side of things. 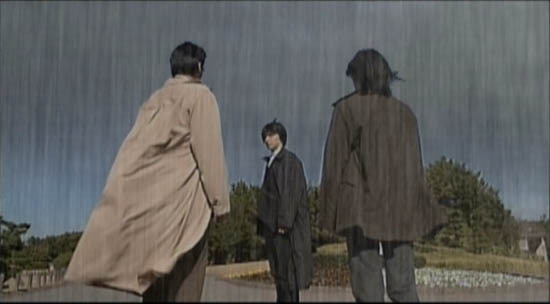 Cheap, made-for-TV looking video lots of times, but Miike always manages to make the best of his low production values. The non-MPD cops’ scenes have a lot of humor, and Chief Sasayama ends up as a really well-defined character by the end, more so than anyone else. Katy didn’t watch this one. Katy would not have liked it.